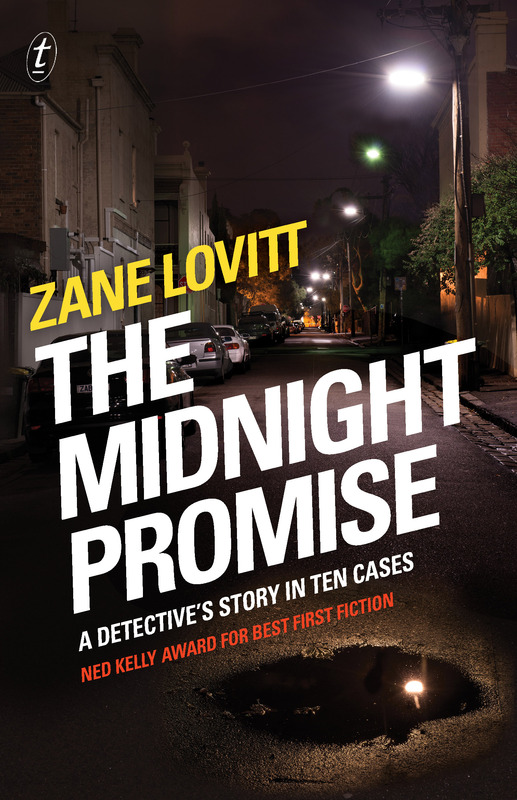 The Midnight Promise, which won the 2013 Best First Fiction category in Australia’s prestigious Ned Kelly Awards. In form, the novel is a collection of ten cases for Melbourne private eye John Dorn, which may remind readers of the immortal Sherlock Holmes collections. In tone, older British readers might compare John Dorn to a younger Frank Marker from the 1960s TV series ‘Public Eye’. MIKE RIPLEY:To begin with, a bit of biography please. Who is Zane Lovitt and what drove him to become a crime writer? ZANE LOVITT: I used to be a documentary filmmaker – not a particularly successful one, but it paid the bills and allowed me to work in film, which I initially thought would be how I got my fictional stories out there. Eventually I had to concede that filmmaking, especially in Australia, is a crap shoot (so to speak), where the odds are against you and they don’t improve with each project you complete. So I resolved to write prose fiction, which meant betting only on myself and how hard I was willing to work. As for why crime fiction, the fact is that, in my very humble opinion, suspense is what draws readers to a story. I’m all for humour and insight and the brilliant use of adjectives, but suspense – the thing that gets the reader turning the page and hanging on your words – is the stuff I look for as a reader, and I want to provide that same experience as a writer. MR: What were your earliest crime fiction influences? Which crime writers do you love/hate/admire, or just read, today? ZL: Today, the truth is I don’t read a lot of crime fiction. Donald Westlake once said that 90% of crime writers write with the same voice, and that’s exactly how I feel when I’m standing in the crime section of a bookshop. They may be great stories, but the words on the page, by which I mean the clichés on the page, usually prevent me from getting through to the end. So when I read fiction, I read for voice – a unique and interesting writing style that provides credibility to the story. I’ve found that, the more authoritative the voice, the more powerful the suspense that hooks the reader. But as a kid, it was a whole different story. I devoured Edgar Allen Poe and Roald Dahl (the latter of whom doesn’t get nearly enough credit for the remarkable stories he wrote for adults, like Lamb to the Slaughter and The Hitchhiker), as well as Sherlock Holmes and Agatha Christie and Hitchcock movies. Sherlock Holmes is probably the biggest influence on my book, The Midnight Promise, because I was trying to create short, stand-alone stories that paid off just as well as the Holmes stories do. Finally, Dashiell Hammett is the grandfather of hardboiled fiction, so there’s no getting around what an influence he’s been. MR: The Midnight Promise is described as ‘A Detective’s Story in Ten Cases’ and the apostrophe in ‘Detective’s’ is rather important, isn’t it? What made you adopt this format instead of a continuous straight-line narrative with a core plot or mystery? ZL: Back when I first decided to write some hardboiled fiction, I had every intention of writing a full-length novel, but I was stymied by the fact that I didn’t know how to write, how to create characters, how to hook the reader… So I resolved to practice, to put together some very short stories using John Dorn’s narrative voice, trying to figure out who he was – once I knew, I’d write the novel. But then I began to enjoy the writing of these stories; for the first time in my artistic life I really liked what I was producing. The idea for the novel fell away and I chose to bring these stories together into a single narrative. Which is an important point to make, and it’s where that apostrophe comes in: while these are intended to be discreet private-investigator stories, they come together to depict a single journey for the protagonist, John Dorn, and run up to a very specific kind of ending. It took about five years to write all the stories (and all the others that didn’t make the cut). That said, I’ll demurely refer you to my answer above. MR: Would you accept/agree that your protagonist, as a ‘private eye’ is(like most private eyes in crime fiction) a catalyst rather than a traditional detective who has to explain clues, compile evidence, interview witnesses, etc. etc.? ZL: What that question hits upon might be the best way to articulate the difference between police-procedural fiction, where the cop is the hero, and hardboiled, where the story centres around a private investigator. Any good writer of private-investigator stories has to explain to the reader why this guy is solving the crime and not the police. And often the answer is because the police are bound by rules and regulations, they’re overly political or bureaucratic, or else some other element of their profession prevents them from being ‘catalysts’. The private eye is just as righteous but less hamstrung. That said, I think most good cop stories will find a way for the cops to become catalysts. Just as, say, Poirot’s investigation directly brings about the second murder in Death on the Nile, so too does Mills and Somerset’s investigation directly impact upon John Doe’s plot in Seven. Any good story will have the protagonist and antagonist affecting each other – it can’t be a one-way street. MR: Some of the stories give us an insight into particular aspects of your hero John Dorn’s life and morals, others are almost boiled-down novels (‘The Crybaby Technique’ for instance, surely has enough content in its various strands and sub-plots to make a full-length book). Would you agree? Do you give consideration to the ‘weight’ of each story as part of a narrative whole or are they self-contained snapshots? ZL: My guiding principle was Don’t repeat yourself, which meant that I’d sometimes be trying to provide a self-contained snapshot, at other times I was trying to depict a significant event in John’s life. The varying lengths of the stories (‘The Crybaby Technique’ is amongst the longest, while ‘Grandma’s House’ is quite short), the varying structures to the stories (some are told chronologically, some are not; one story, for instance, is told backwards) as well as the many different parts of Melbourne where the stories unfold, and of course the different characters John encounters, were designed first and foremost to mix up the reader’s experience. When you’re using the structure of short stories (to create a whole), if the reader gets the sense that you’re repeating yourself, you’re screwed. MR: What sort of a guy do you think John Dorn is? At times he comes across as seriously damaged. Is he beyond redemption? Would you entrust him with a private inquiry? Would you spend an evening drinking with him? ZL: Honestly, it depends which John we’re talking about. There are times in the book when he’s in a hole and he wouldn’t drink with me if I paid him to. At other points in the story, he doesn’t drink. MR: There are clear nods of homage to private eyes created by Raymond Chandler and Dashiell Hammett (and James Crumley, possibly?). Is John Dorn in the mould of Chandler’s Phillip Marlowe as the Knight Errant in slightly tarnished armour, or does he owe more to Hammett’s Sam Spade, more of a blunt instrument? Though it may sound phenomenally ungrateful, I have to confess I don’t love Raymond Chandler’s books. I find them a little too contrived, which is compounded by the fact that Chandler himself famously railed against contrivance – that hypocrisy is a bit much for me. Dashiell Hammett, on the other hand, is the real thing. He was a private investigator before he took to writing fiction, and his short stories about the nameless Continental Operative were a massive influence on my JD stories. The goal, for me, was to take on the recognisable conventions of hardboiled fiction, but then to apply them to more everyday scenarios. There aren’t a lot of guns in my book. There are no car chases. The stakes are high, and the tension is there, but I try to do it with the promise of violence and action, or else our everyday fear of it. I’m not interested in stories about serial killers, because they’re not a part of my life. But my fear of serial killers often rears its head, whenever there’s a van parked next to my car at the supermarket, or whenever my wife is half-an-hour late getting home. This is the kind of stuff to which I like to apply the private detective story. MR: For the benefit of readers (of this) in the UK, where private investigators are unlicensed and usually treated with deep suspicion as they tend to work for credit companies or newspapers – if they know how to hack a phone, what is their status in Australia? What does getting ‘a licence’ entail and is it as easy as it seems to be in the book? ZL: I made it all up. I haven’t the faintest idea what life is like for a genuine Australian private detective. That said, I made some educated guesses. Private investigators might assist the defence team in a big trial, so as to balance out the investigative skills the prosecution has at its disposal in the form of the police force. Moreover, apart from the invariable investigations into infidelity, I think PIs often do a lot of boring stuff: sifting through documents and searching for information online. My goal was to start JD out in cases that seemed straightforward (ie. realistic), but to twist them into something more, while remaining true to that goal of creating plausible stories about Australian and western culture at this time in history. MR; Would you like to explain the meaning of the title of ‘The Midnight Promise’? ZL: John’s mother taught him that a midnight promise is one you make but which you have no intention of keeping – like the promise you make to God when your plane flies through heavy turbulence, or the stuff men say to women to get them undressed. More than that I’m not going to say, because it’s the ending of the book. Put simply, the midnight promise is a moment that changes John’s life.